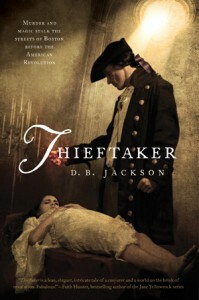 Ethan Kaille is a thieftaker and a conjurer living in Boston in 1765. Around him, discontent with Britain and taxes swirl, but Ethan, having already paid the price years earlier for mutiny, wants nothing to do with the Sons of Liberty. However, a girl–young woman–is killed during a riot, and the girl’s father asks him to return the brooch stolen from her body. Not only does the other thieftaker in Boston, Sephira Pryce, not want him involved, but the death seems to have occurred through conjuring–a magick that is far stronger than anything Ethan could achieve. So here we have an historical crime fantasy–all my favorite ingredients in a single book. Is this a perfect book? No. Is it a good and interesting book? Definitely. I enjoyed the historical bits very much, especially since Ethan doesn’t have much interest in the Sons of Liberty movement, and sees their attacks by mobs led by Ebenezer Mackintosh on the lieutenant governor Hutchinson’s house as beyond the pale. I also enjoyed the fact that I’ve actually been in Boston now, and could somewhat picture the areas where events were taking place (only somewhat, as Boston today is very different from Boston more than two centuries ago). The author makes it clear that there he lifted the idea of thieftakers from London and moved them to Boston, where they didn’t actually exist at that time, but that’s the advantage of fantasy–you can weave in bits that never happened with bits that did and enjoy the end result. Of course, the mystery is also quite interesting, and Ethan is a fascinating character. I’m not quite sure the secondary characters, aside from Sephira, were as well-developed, but if this is going to be a series, there is plenty of time for that. Because I’d quite like to know what Mister Pell decides to do with himself.